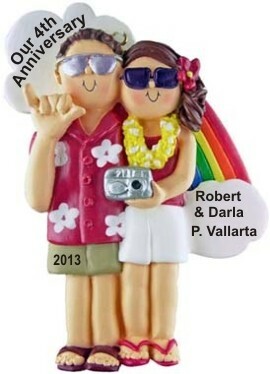 For those celebrating an anniversary with a trip to the beach, this wonderful couple ornament makes a great memento. With sand and sea and rainbow in the background, celebrate any number of married years by personalizing the ornament with your name phrase, the destination of your anniversary celebration, the year, and your custom sentiment. Our Anniversary Couple, Both Brunette Hair ornament measures 4"H, and arrives in our black velvet pouch. Anniversary memories of Hawaii Dec 15, 2014 Andrea T.